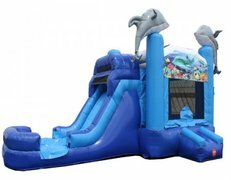 Dolphin combo-slide can be used as a wet or dry slide. Comes with a basket ball hoop inside! This unit uses 2 electrical outlets.